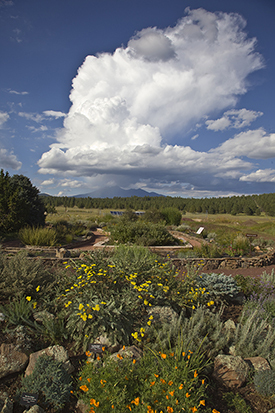 Every garden in the Flagstaff area offers its gardener unique opportunities and challenges. Each has its own combination of high and low temperatures, exposure to the sun, degree of slope, precipitation, wind intensity, and soil. Whereas gardeners in other parts of the country can often design with only color and form in mind, gardeners here must carefully observe their particular location, allowing nature to shape their vision and guide their decisions. To learn more about the character of your particular site, see the Worksheets column. Here you’ll find Map Your Site, Measure Your Slope, Evaluate Your Site’s Potential, and Design Your Garden. Consult our Advice column for practical suggestions including Improve Your Soil, Hardscape, Conserve Water, and Choose Your Plants. You’ll also find Notes from Master Gardeners and Essays from High Country Gardener. connection between climate and all living things.